A serial killer is loose in Richmond, specializing in attractive young couples whose bodies are invariably found in the woods months later — minus their shoes andsocks. Chief Medical Officer Dr Kay Scarpetta finds herself tracking a killer whoscrupulously eliminates every clue, rendering all her forensic skills useless. This time it's her courage and intuition on the line in a race against time. 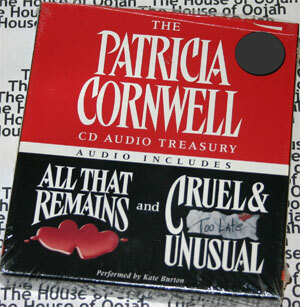 Patricia Cornwell is the author of a popular series of crime novels, many featuring the fictional heroine "Dr. Kay Scarpetta", a medical examiner. She was born in Miami, Florida. She is a descendant of Harriet Beecher Stowe.Shortly after graduating Davidson College (in North Carolina), she married her English Professor Dr. Charles Cornwell, 17 years her senior. Dr. Cornwell left his tenured professorship to become a preacher, and Patricia began writing a biography of Billy Graham's wife. They divorced shortly thereafter. Cornwell has made several notable charitable acts, including funding scholarships to the University of Tennessee's National Forensics Academy, Davidson College's Creative Writing Program, and donating her collection of Walter Sickert paintings to Harvard University. Eugene Bennett, a former FBI agent, attempted to murder his wife, Marguerite, in 1996 because he thought that she had had an affair four years earlier with Cornwell. The Scarpetta novels include a great deal of detail on forensics. The solution to the mystery usually is found in the forensic investigation of the murder victim's corpse, although Scarpetta does considerably more field investigation and confrontation with suspects than real-life medical examiners. The novels are considered to have influenced the development of popular TV series on forensics, both fictional, such as CSI: Crime Scene Investigation, and documentaries, such as Cold Case Squad. Procedural details are part of the allure of her novels. Cornwell herself worked at a crime lab in Virginia as a technical writer and computer analyst but not in any official medical or forensics capacity. Her attempts to portray herself as an expert in those fields have caused some bad feelings from those who have actual training and licensing, including Kathy Reichs, who is both a board-certified forensic anthropologist and a crime novelist. Other significant themes in the Scarpetta novels include health in general; individual safety and security; food; and family. Although scenes from the novels take place in a variety of locations around the U.S. and (less commonly) internationally, the city of Richmond, Virginia features prominently. Besides the Scarpetta novels, Cornwell has written three more light-hearted police fictions featuring Andy Brazil, as well as a number of works of non-fiction. Cornwell has been involved in a continuing, self-financed search for evidence to support her theory that painter Walter Sickert was Jack the Ripper. She published Portrait of a Killer: Jack the Ripper - Case Closed in 2002 to much controversy, especially within the British art world, where Sickert's work is admired, and also among Ripperologists, who criticize her methods and conclusions. See Portrait of a Killer for further information. However, Cornwell denies a Jack the Ripper obsession in full-page ads in two British newspapers.